If you’re a B2B SaaS platform like us, you know how challenging sales and marketing can be. Finding new leads, converting customers and keeping clients happy are all part of a healthy customer lifecycle. So how, exactly, did we at Hatchbuck increase revenue by 2000% in just six years??? Our website is built on WordPress, sure. But it runs on Hatchbuck. For every page visit, resource download, newsletter sign-up and demo request, there’s a Hatchbuck action being performed in the background to help the best leads surface to the top – and make the transition from MQL to SQL to customer. This means that our site isn’t just there to inform or educate – its primary purpose is to convert. Conversion is our mantra, and it guides every move we make. What’s a visitor’s path? Where do we put the button to get more clicks? Are we asking for too many (or too few) form fields? Tools of the trade? We use Google Analytics conversion tracking to assess site performance and run a/b page tests. Crazy Egg heat mapping tool shows us how our visitors are engaging with the site: what they’re clicking on, how far down the page they’re scrolling and where they go next. We’re continually testing and optimizing our site – all in the name of generating more marketing qualified leads. We’ve put many hours, blood, sweat and tears into our content – and our hard work has paid off. To date, Hatchbuck has published nearly 1000 blog posts and tens of in-depth, value-added resources. We always put content at the center of our marketing strategy, and in 2016, we really amped up our efforts to publish to our blog 5 days a week. It takes a lot of work and a lot of planning, but the results are well worth the effort. In just two years, we’ve increased organic search traffic by 171%. While these visitors usually aren’t ready to demo a product yet and require a little more nurturing than leads coming from paid search, they are more likely to convert down the road. 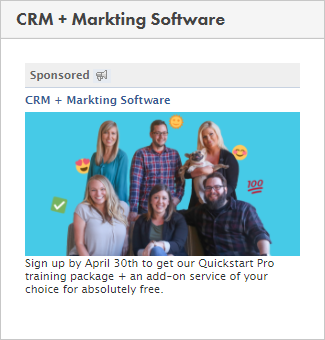 Add Tags: Adding the resource tag makes it simple to filter our contact list by everyone who has downloaded a resource, while the “Facebook Webinar” tag can help us get even more granular and show us who is particularly interested in Facebook or social media. Send an Autoresponder: The autoresponder has the actual link to the webinar, providing a seamless experience for the contact. Update the Contact Record: Here, we set their status to Prospect (warmer than a cold lead, but not as hot as an opportunity on our pipeline). We also set the lead source to “Resource Download” to help us measure the effectiveness of this particular channel. 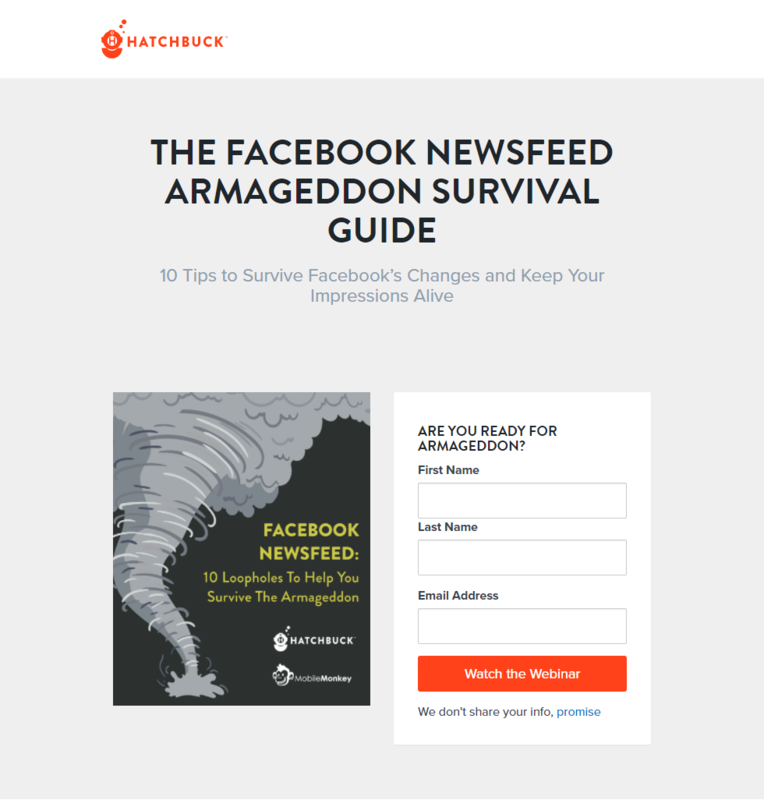 Start a Campaign: Our hook – in this case, Facebook newsfeed changes – was effective at bringing leads into the funnel. But we risk them just sitting at the top if we don’t take further action. So we also start new leads on a nurture campaign. We mention that they downloaded a resource from our site. This helps remind them why they’re receiving the email – and helps us to steer clear of spam complaints. We’ve added a link and can add automations to it. In this case, when the recipient clicks the Persona Workbook, we add a “Persona Workbook” tag to help segment our contacts by their interests. We keep it short and friendly. Not every email has to be an HTML masterpiece. Sometimes simple text-based emails make the conversation feel more personal. Of course, online advertising is a healthy part of any marketing budget and helps to capture leads who are actively searching for your solution. We’ve refined our strategy and are driving leads at a cost-effective CPA every month with Adwords, Facebook ads and retargeting. 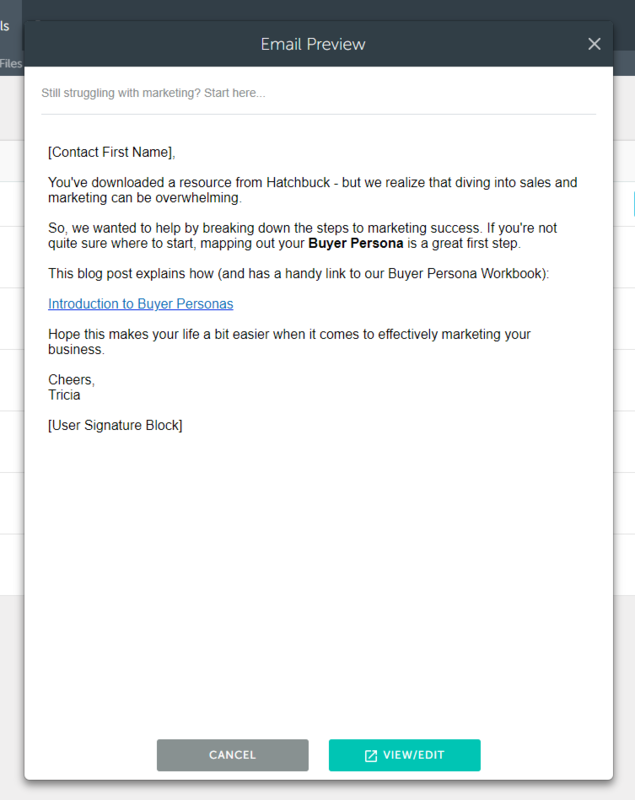 Hatchbuck is essential in turning this traffic into marketing-qualified leads. 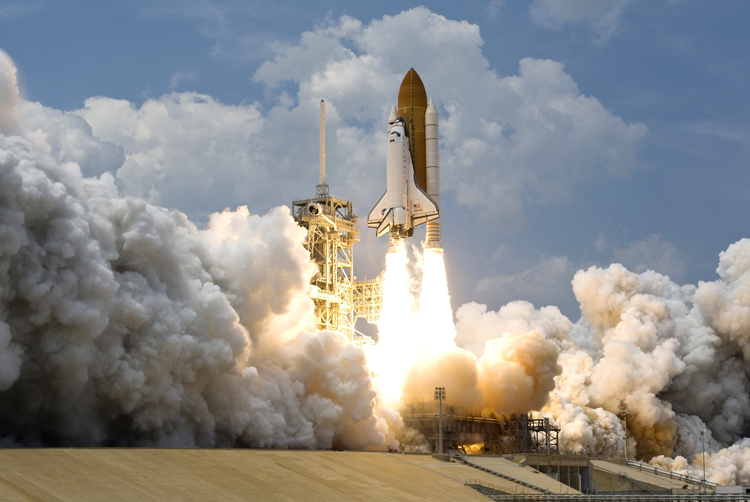 It begins by driving paid traffic to specific landing pages. First, we are able to link conversions to the campaign they came from – whether it’s an online display ad, a specific Adwords keyword, or a resource download from a Facebook campaign. The ability to track the last-touch lead source of every new lead is essential for deciding which channels and campaigns we invest in. 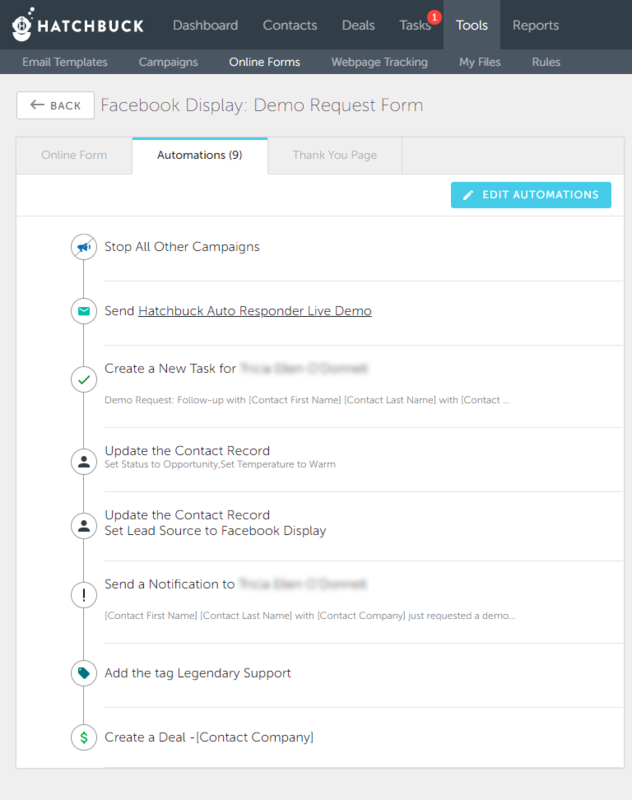 Stop Campaigns: For us, a demo request designates a hand-off from marketing to sales. We stop all marketing campaigns to keep communication relevant. Send Autoresponder: Provides a relevant, timely follow-up and lays out next steps. Create a Task: Makes it simple for our sales team to stay organized and follow-up with new opportunities. Update Contact Record: We make a status change from “Lead” to “Opportunity,” update the lead source and set the contact’s temperature to warm. Send a Notification: What better way to let your team know there’s a hot lead than right in their inbox? We’ve created a task, but we also send an email to let our sales team know there’s a lead that needs follow-up. 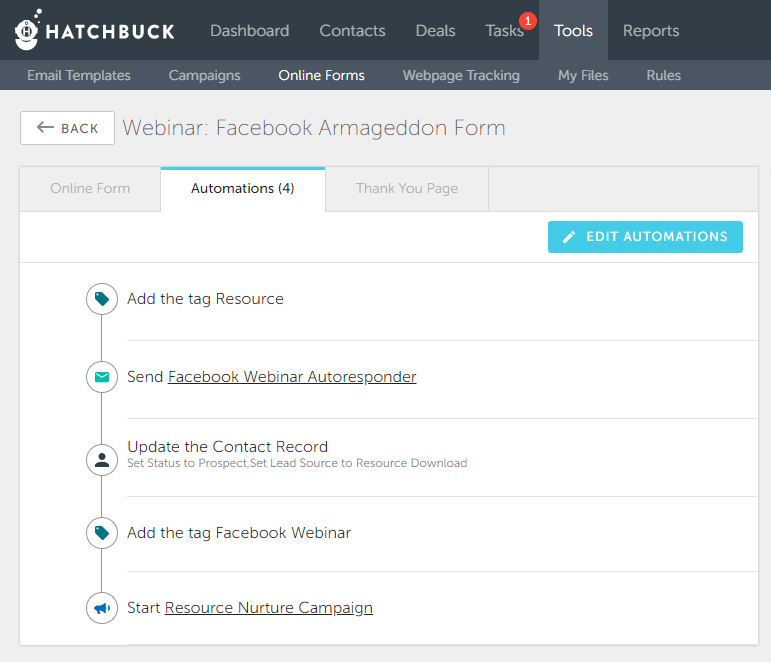 Add a Tag: Tags are super useful for segmenting leads based on their interests. Here, we know that this lead converted from a campaign featuring our support team, so customer support is extra important to them. Create a Deal: A deal designates that the lead has entered the sales funnel and is on the path to close (hence, the dollar sign 🙂 ). Again, this is a hand-off to the sales team who will drive the deal down the funnel to close. With Hatchbuck, we make sure that every hot opportunity is being tracked, tallied and followed up with – ensuring no one slips through the cracks. Our gated content and demo request forms are static ways we can capture new leads – but we’ve added artificial intelligence into the mix to drive qualified leads into a chat with our sales team. Our chatbot, Drift, is able to start a relevant conversation on the site and help our visitors get their questions answered faster. If you’re in sales, you know that getting to the “no” is just as important as getting to the “yes.” When you weed out leads who won’t convert because pricing, features or timing just isn’t a fit, you have more time to invest in real opportunities. 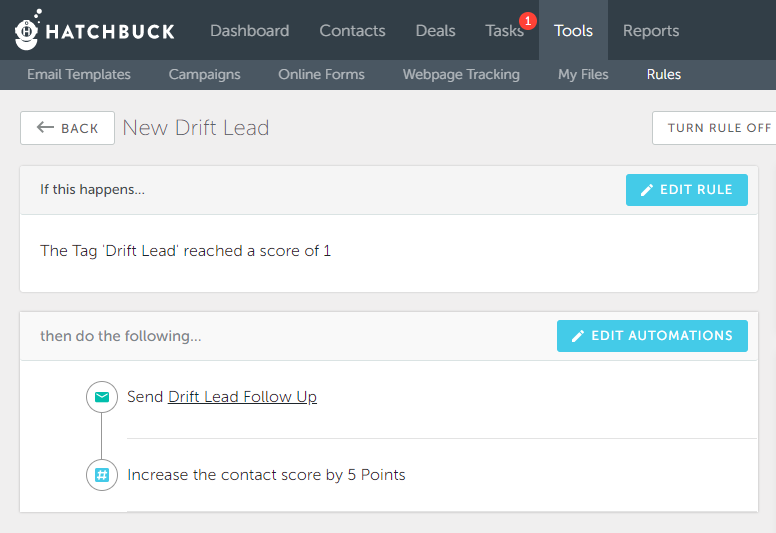 With this tag, we create a tag rule in Hatchbuck to trigger a follow-up email and increase the contact score. Hatchbuck + Drift + Zapier is an easy way for us to make every conversation on our site count. One of the most powerful things about Hatchbuck is the ability to send relevant messages to your prospects and increase engagement until they buy. Dynamically segmenting your list with tags and rules can be a powerful way to find and convert quality leads. 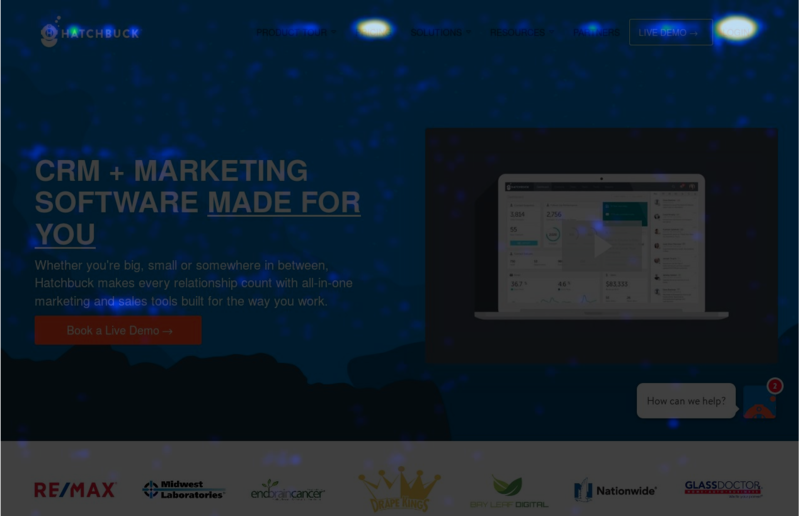 For instance, we add an “Email Marketing” tag to leads who visit email marketing blog posts on our website. 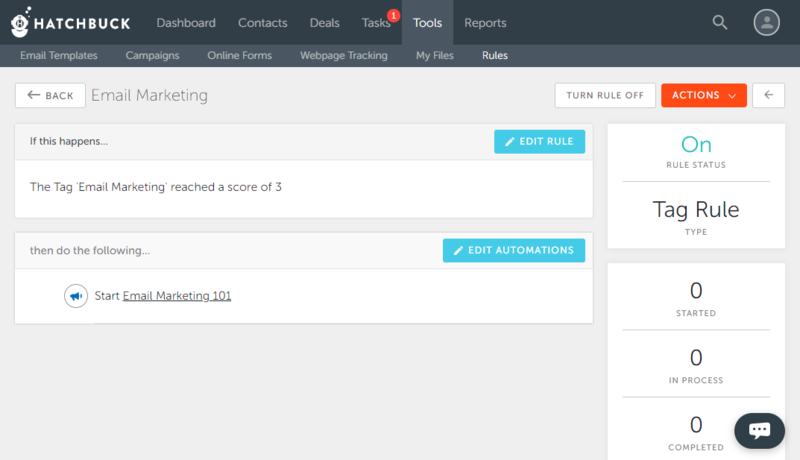 When the “Email Marketing” tag score reaches 3, start the contact on our “Email Marketing 101” campaign. 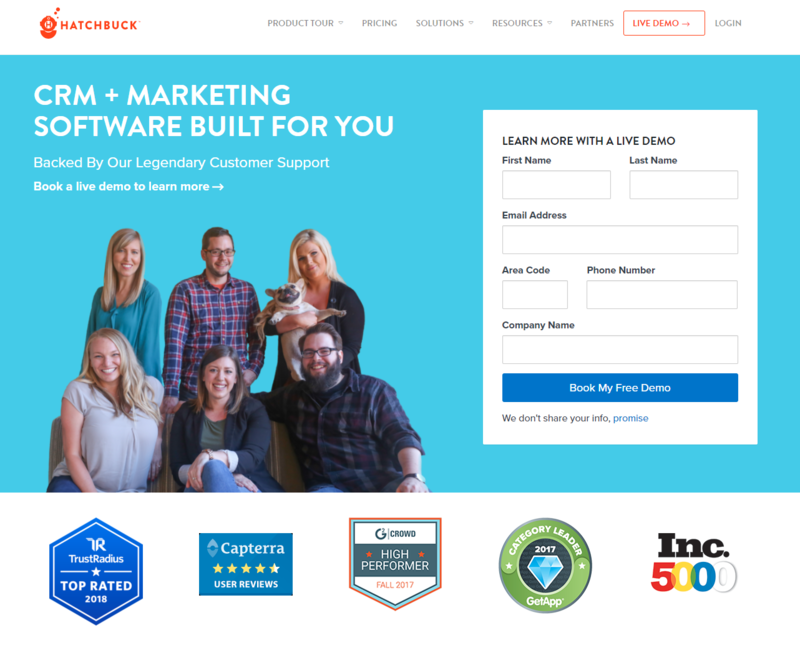 Hatchbuck sales and marketing software provides us with so many ways to close in on qualified leads and convert them to customers. Your business can, too. 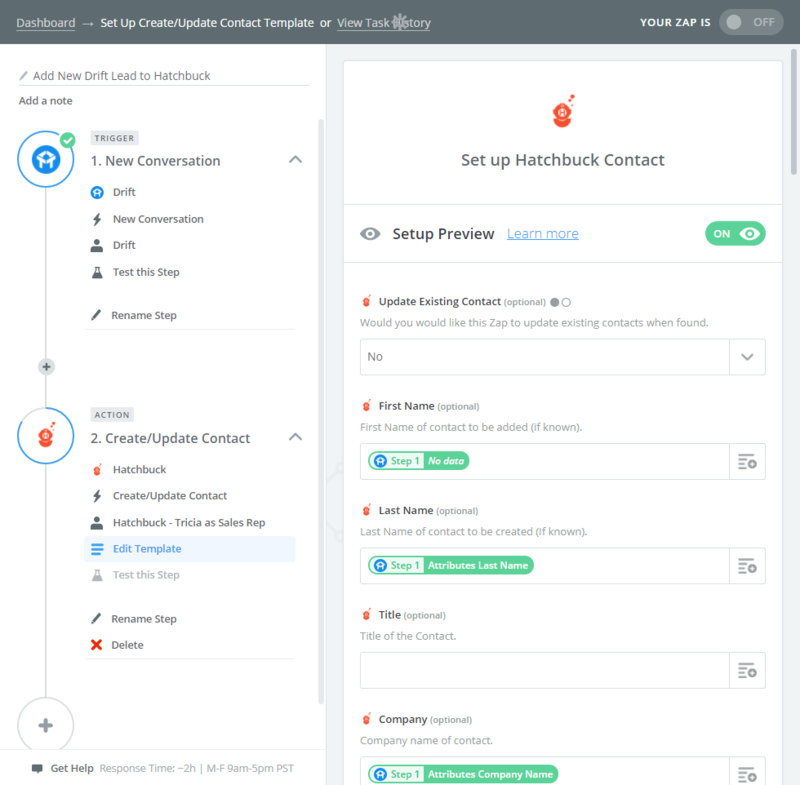 A live demo is the best way to see Hatchbuck in action and talk to one of our savvy, no-pressure sales consultants about the best ways you can leverage Hatchbuck to double, triple or quadruple your growth. Is An Agile Marketing Process Right For Your Team?